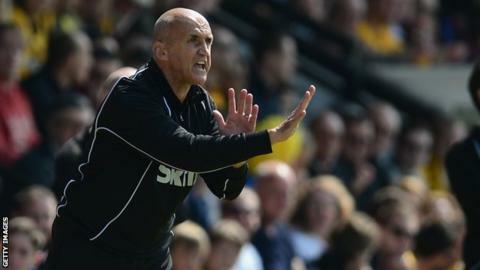 Cambridge United chairman Dave Doggett has called on supporters to trust their "exceptional" manager Richard Money. The U's ended a run of five defeats by winning Sunday's play-off second leg against Halifax to progress to the Conference Premier final. Doggett told BBC Radio Cambridgeshire: "Richard is an exceptional coach. Cambridge United will become the first team to play in three Conference Premier play-off finals when they face Gateshead at Wembley on 18 May. Unfortunately they lost both of the previous finals, to Exeter in 2008 and Torquay in 2009. "Some of our fans think that they know better. But they don't. Trust the man. He is superb. The players believe in him 200% - the fans should as well." Some U's fans had been concerned by Money's rotation of players in the final four league games of the campaign, after the Abbey side had sealed second place in the table. That run led to a 1-0 first-leg defeat at Halifax, but was overturned with a 2-0 win that secured a third play-off final in six years for Cambridge, who lost their previous two in 2008 and 2009. "I was saying to people in the week who were quite pessimistic, 'for goodness sake, be positive'," said Doggett, whose side face Gateshead at Wembley on 18 May. "Positivity is what this club is about. "We hoped we would do it. It was a long time coming. The joy on the fans' faces will live with me forever."